This library has been on my list to see for many years. 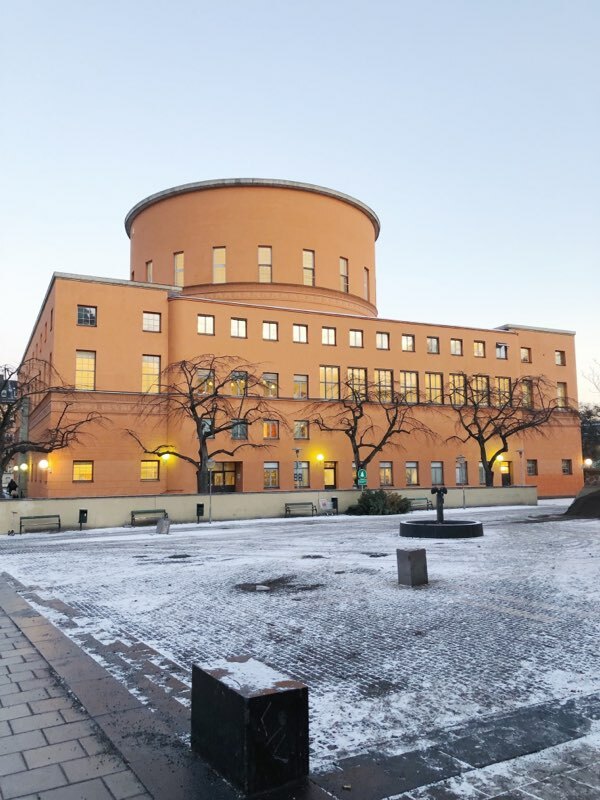 Asplund was the mentor to Aalto and is a foundational architect in Sweden. This is his most renowned building and it did not disappoint. The scale of the space is both intimate and awe inspiring. 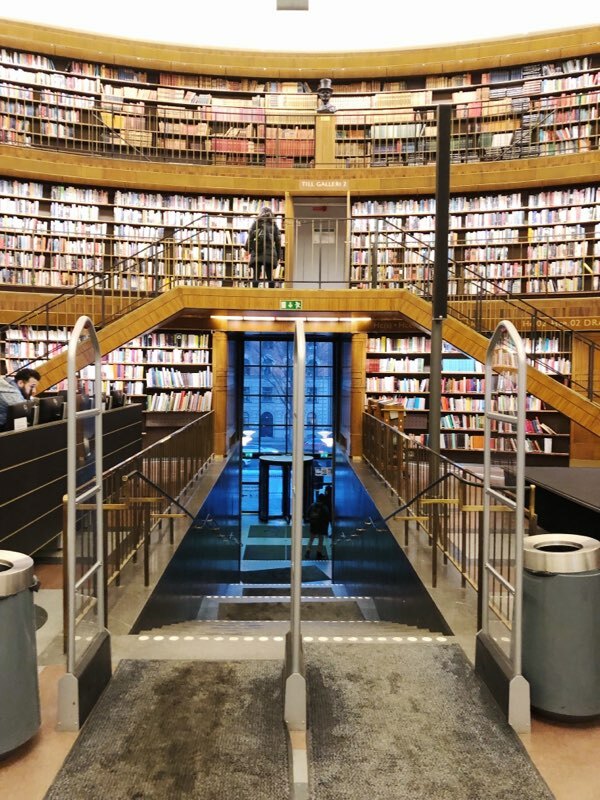 As you enter the reading room with is a large circular room with stacks that surround the room and rise up three levels. 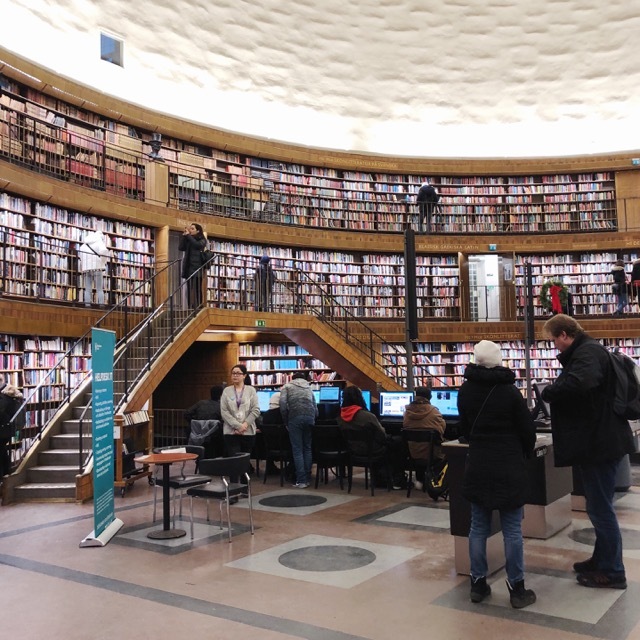 It harkens back to ancient ideas about how the form of a space can create a context of discovery- an example can be seen in the conjecture of what the library in Alexandria looked like. 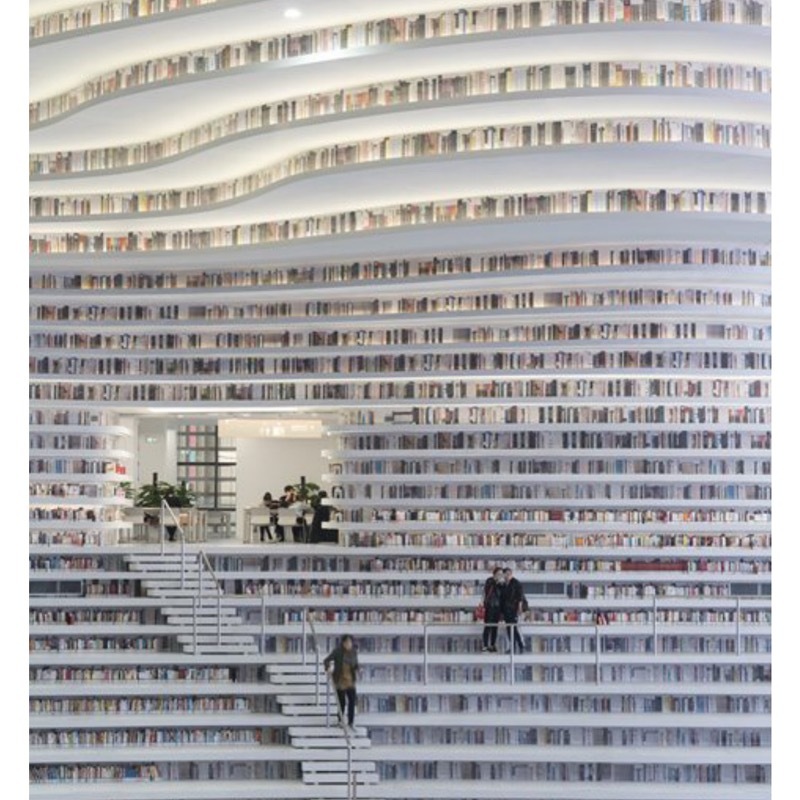 We also see how Asplund’s library inspired MVRDV in their design for the Tianjin Binhai Library completed in 2017. The space was a study in light. 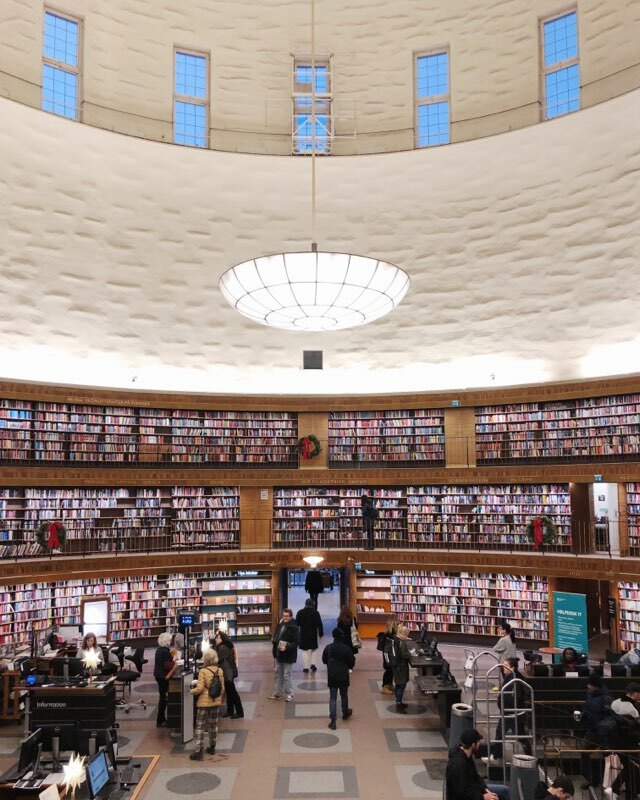 The dome of the library is formed by rusticated plaster walls that are separated into two sections to relate to the sections of the stacks. This large scale white texture is in wonderful contrast to the scale of the walnut colored layered book stacks. The small texture of the books and words describing each section are a great connection to the human body. The hidden light of the white dome begs you to think of illumination that one obtains with the pursuit of knowledge and the inspiration of ideas. The light in the dome is from a recessed source that highlights the rusticated from of the dome. From the center of the dome hangs a large bowl pendent. This object centers the room and connects the dome and the stacks together. The light at the body scale comes from a custom light track that extends from the stacks themselves. It provides great light but also an intimacy that is needed in this large reading room. The stairs that lead you to the stacks are bronze and brass and refined in scale and details. The flooring of the reading room is linoleum. I am surprised at how often is see linoleum in places you wouldn’t expect. Table tops, floors in monumental spaces, stairs. What it does at the library is soften the floor acoustically and under foot. The experience was monumental. It was a wonderful building and works as well now in a world that doesn’t need physical books (but we do – I know) as it did when it first opened to the public. 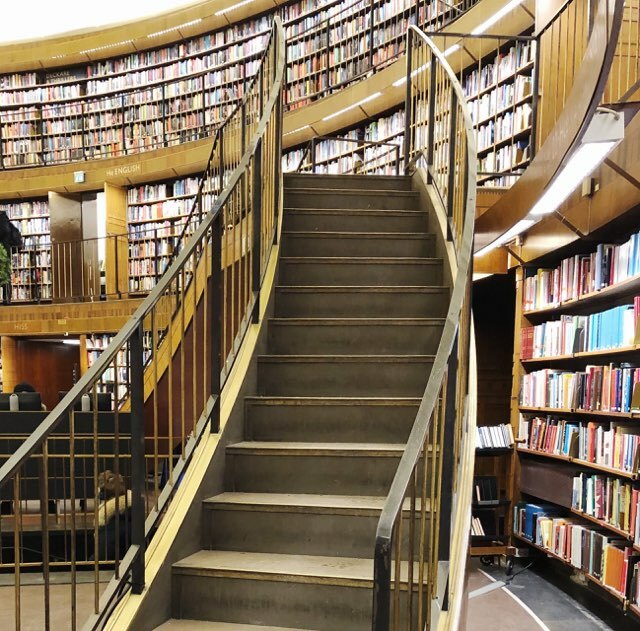 Libraries are one of the only public spaces free of commerce and privatization left in modern cities. This library is fine example of space you want to be in and is a monument to inspiration. Influence from this library can be seen in MVRDV’s design for the Tianjin Binhai Library in 2017. Betsy Vohs on Shop Girls Radio!